**State Secretary for Foreign Affairs. 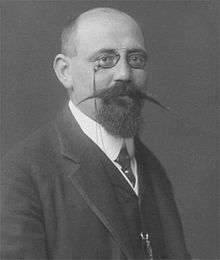 Karl Renner (14 December 1870 – 31 December 1950) was an Austrian politician of the Socialist Party. He is called the Father of the Republic because he headed the first government in German Austria and the First Austrian Republic in 1918/19, and was once again decisive in establishing the present Second Republic after the fall of Nazi Germany in 1945, becoming its first President. Renner was born the 18th child of a German family of poor wine-growers in Unter-Tannowitz (present-day Dolní Dunajovice in the Czech Republic), then part of the Margraviate of Moravia, a crown land of the Austro-Hungarian Empire. Because of his intelligence, he was allowed to attend a selective gymnasium in nearby Nikolsburg (Mikulov), where one of his teachers was Wilhelm Jerusalem. From 1890 to 1896 he studied law at the University of Vienna. In 1895 he was one of the founding members of the Friends of Nature (German: Naturfreunde) organisation and created their logo. In 1896 he joined the Social Democratic Workers' Party of Austria (SDAP), representing the party in the National Council (German: Reichsrat) from the 1907 elections until its dissolution in November 1918. His interest in politics also led him to become a librarian for the Reichsrat. During these early years, he developed new perspectives on law — all the while cloaking his innovative ideas under a variety of pseudonyms (for example, Synopticus and Rudolf Springer) lest he lose his coveted post as parliamentary librarian. He was especially interested in the problems of the Austrian state, whose existence he justified on geographical, economic and political grounds. On the nationality question, he upheld the so-called “personal autonomy,” on the basis of which the super-national state should develop, and thereby influenced the agenda and tactics of the Social Democratic Party in dealing with it. As a theorist he was reckoned as one of the leaders of Austro-Marxism. He was the leader of the delegation that represented this new German-Austria in the negotiations of St. Germain where the "Republic of Austria" was acknowledged but was declared to be the responsible successor to Imperial Austria. There Renner had to accept that this new Austria was prohibited any political association with Germany and he had to accept the loss of German speaking South Tyrol and the German-speaking parts of Bohemia and Moravia where he himself was born; this forced him to give up his share in the parental farm if he, "the peasant proprietor who turned Marxist", wanted to remain an Austrian government officer. Renner was Chancellor of Austria of the first three coalition cabinets from 1918 until 1920 and at the same time Minister of Foreign Affairs, backed by a grand coalition of Social Democrats and Christian Social Party. A wide range of social reforms were introduced by Renner's government, including unemployment insurance, paid holidays, the eight-hour workday, and regulations on the working conditions of miners, bakers, women, and children. State aid was also provided for the disabled, together with health insurance for public employees. In addition, a law was passed that provided for collective bargaining and the mediation of disputes. From 1931 to 1933, Renner was President of Parliament, the National Council of Austria. After the authoritarian Austrofascism period from 1934, when his party was prohibited, he even welcomed the Anschluss in 1938. Having originally been a proponent of new German-Austria becoming a part of the democratic German Republic, he expected Nazism to be but a passing phenomenon not worse than the dictatorship of Dollfuss's and Schuschnigg's authoritarian one-party system. During World War II, however, he distanced himself from politics completely. In April 1945, just before the collapse of the Third Reich, the defeat of Germany and the end of the war, Renner set up a Provisional Government in Vienna with other politicians from the three revived parties Socialist Party (SPÖ), Austrian People's Party (ÖVP, a conservative successor to the Christian Social Party) and Communist Party (KPÖ). 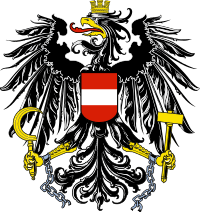 On April 27, by a declaration, this Provisional Government separated Austria from Germany and campaigned for the country to be acknowledged as an independent republic. As a result of Renner's actions Austria was to benefit greatly in the eyes of the Allies as she had fulfilled the stipulation of the Moscow Declaration of 1943, where the Foreign Secretaries of US, UK and USSR declared that the annexation (Anschluss) of Austria by Germany was null and void calling for the establishment of a free Austria after the victory over Nazi Germany provided that Austria could demonstrate that she had undertaken suitable actions of her own in that direction. Thus Austria, having been invaded by Germany, was treated as an unwilling party and "the first victim" of Nazi Germany. 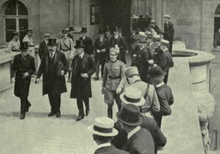 Being suspicious of the fact that the Russians in Vienna were the first to accept Renner's Cabinet, the Western Allies hesitated half a year with their recognition, but his Provisional Government was in the end recognised by all Four Powers on October 20 and Renner was thus the first post-war Chancellor. In late 1945, he was elected the first President of the Second Republic. Karl Renner died in 1950 in Vienna and was buried in the Presidential Tomb at the Zentralfriedhof. For most of his life, Renner alternated between the political commitment of a Social Democrat and the analytical distance of an academic scholar. Central to Renner's academic work is the problem of the relationship between private law and private property. With his Rechtsinstitute des Privatrechts und ihre soziale Funktion. Ein Beitrag zur Kritik des bürgerlichen Rechts [The Institutions of Private Law and their Social Functions] (1904), he became one of the founders of the discipline of the sociology of law. In this book, Renner developed a Marxist theory of the institution of private law. Renner argued that the separation of public and private law is a creation of capitalism, whereby the state enforces the interests of capital owners. His and Otto Bauer's ideas about the legal protection of cultural minorities were taken up by the Jewish Bund, but fiercely denounced by Vladimir Lenin. Joseph Stalin devoted a whole chapter to criticising Cultural National Autonomy in Marxism and the National Question. The 1977–1978 academic year at the College of Europe was named in his honour. Joseph Karner (penname), "Die Soziale Funktion der Rechtsinstitute" (1904) in Marx-Studien, vol. 1. Porträt einer Evolution in Nachgelassene Werke, vol. 2, edited by Adolf Schärf, Vienna: Verlag der Wiener Volksbuchhandlung, 1953. ↑ Chisholm, Hugh, ed. (1922). "Renner, Karl". Encyclopædia Britannica (12th ed.). London & New York. Stephane Pierre-Caps, "Karl Renner et l'Etat Multinationale: Contribution Juridique á la Solution d'Imbroglios Politiques Contemporains", Droit et Societé 27 (1994), 421-441.